I few people have asked to see the court order issued by the judge today. Page one is below – there are 13 more pages just like it. I realize it is difficult to understand. The judge is responding to the emails the City redacted point by point. It may be available on line somewhere along with all the other documents filed by me and the City. Of course, no media was there, so don’t expect them to report it. I won. The judge issued a 14 page ruling. The City was given two weeks to turn over information she ruled did not qualify for exemption. I have no idea what that is. Since my lawsuit was the first ever Freedom of Information Act suit filed in McLean County, the judge did not have any experience with this kind of case. I’m not sure she understands exempting documents because they express an “opinion”. The Attorney General has ruled that opinions must be “pre-decisional” or “deliberative”. The judge took a broader view. If I have a problem in the future it may be necessary to appeal rulings to the Appellate Court. The judge was unaware that paying my court costs is allowed in the FOIA law. I gave her and the City Attorney an itemized list. She scheduled a hearing for February, although Jeff Jurgens (City Attorney) did say the hearing might be unnecessary if we can work out the details. 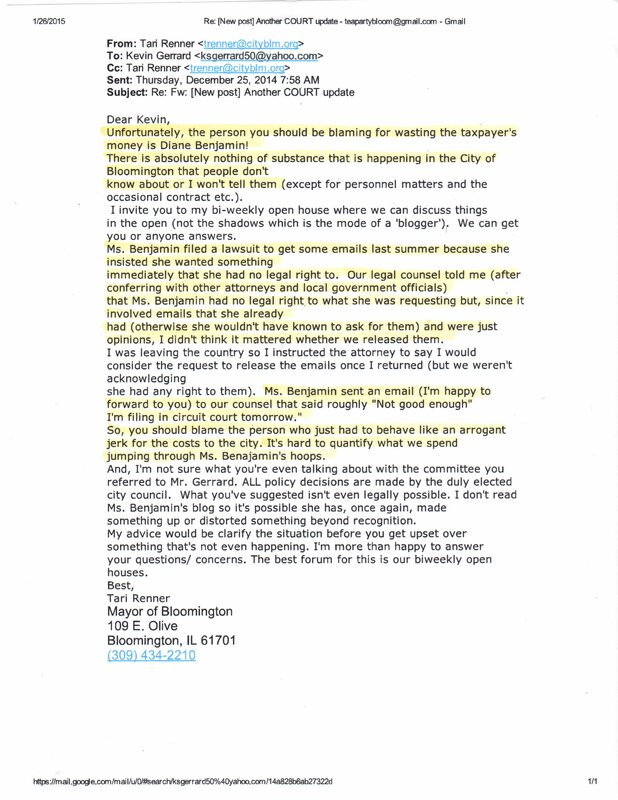 Below is the Renner email where he blames me for lawyer fees incurred by the City. As usual, he uses his own facts instead of the truth. Tari, I did have a legal right to what I got. You have produced no proof that legal council said I didn’t – the judge just ruled you are incorrect. No, I did not already have the emails or I wouldn’t have filed a court case. One thing Tari did get right is the email I sent saying “Not good enough”. This was after they denied numerous FOIA requests illegally and refused to comply. My correspondence was a last attempt to have the law followed before filing the court case. You left that part out Tari. Tari, you claim there is absolutely nothing of substance happening in the City of Bloomington that people don’t know about. Really? How about the Coliseum Tari? Do the citizens know their accounting was shoddy at best since 2011? Do they know the audited statements are MUCH different from CIAM statements? Do they know David Hales did nothing to correct the problem – it was only partially fixed when I started writing about it. I will be waiting for your public apology Tari. Let me know when to expect it. 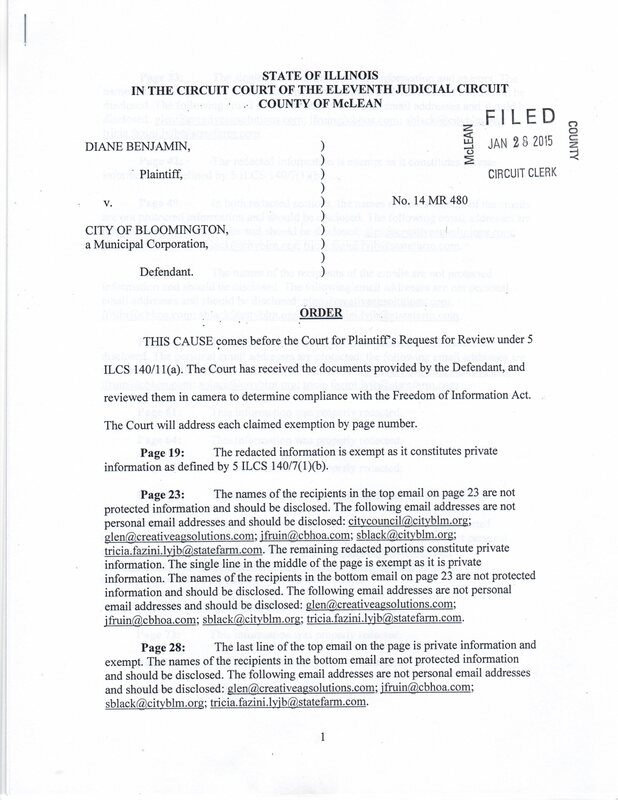 Posted in BloNo, Bloomington, Local, Renner, Taxes.Tagged lawsuit, Tari Renner, transparency. Congrats…. Hopefully this will end city’s attempts to stonewall. Do you know if the ruling is (or will be) available online? I assume it’s on-line somewhere, but it’s tough to read. It’s pages and pages of statements pertaining to emails the judge reviewed that I have no details on. I can post the first page if that helps. I will scan the first page and add it to the post in a little while. Have some things I have to finish first. Since the media isn’t going to ask him anything, he will act like nothing happened. Congratulations. As a weary tax payer, I really appreciate the work being done here. Thank you for doing this. As a taxpayer I am grateful for people like you doing the government watchdog job that the media abdicated. I am also upset that my tax dollars had to be wasted, and for that I blame the city. Still I consider it money well spent to get some power back to the people where it belongs. On another note, why are opinions protected from FOIA requests? We citizens should have access to almost everything that goes on so we can know the motives behind decisions. Half baked ideas being tossed around can be secret. Usually when they come out they are still half, but they can have time to contemplate with each other. I WILL SHARE WITH PUBLIC PLEASE DO NOT GIVE UP! Next Post I thought Tari said Bloomington was LOW crime!